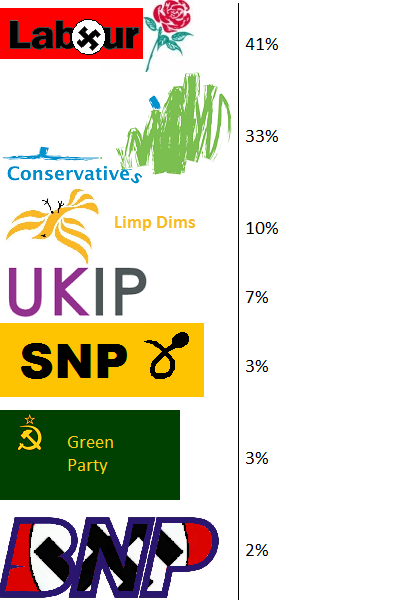 A survey of voting intentions by polling company VisionCritical published today puts UKIP on 7%, just 3% behind the Limp Dims. Worryingly, 41% of people would still vote Labour despite them almost single-handedly bankrupting the country during the reign of King Gordon the Nothingth. 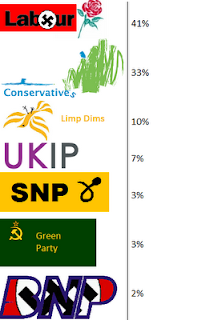 The Tories are sitting on 33%, the Lib Dems on 10%, UKIP 7%, the SNP 3%, the Green Party 3% and the BNP 2%. The poll also shows that Cast Iron Dave's approval rating has stayed at 41%, Cleggover is down 20 points in 10 months to just 30% and Red Ed is on 33%. Approval rating for the other party leaders isn't measured. The other thing the poll measured was voting intentions for the AV referendum: 32% in favour, 26% against and 35% undecided.